The New York Post's Page Six reports that Star Jones Reynolds is threatening to sue PETA for using the cross-dressing impersonator in a new ad campaign. PETA's all aggravated that Star wears real fur. The lard-assed loudmouth is apparently worried that people won't be able to tell the difference between her and a drag queen. And we're loving watching this absurd drama unfold. For the first time, Fox has won sweeps, thanks to the Super Bowl and American Idol. The network won in both viewers and the 18-49 demo. Also for the first time, NBC finished fourth. But remember Zucker's mantra: Sweeps are obsolete! In other ratings news, the One Day At A Time reunion tanked; Peter Jennings' UFO special did surprisingly well; and more people love seeing Stars Without Makeup than I would have expected. ABC’s All My Children earned a leading 18 Daytime Emmy nominations Wednesday, while The View and The Ellen DeGeneres Show both had 11 in talk show categories. DeGeneres’ show won last year for best talk show, and will be competing in that category this year against The View, Live With Regis & Kelly, Dr. Phil and Soap Talk. I can't bear to write any more about these pointless awards. If you need more info, read this. 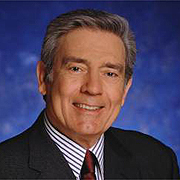 Viacom big-shot Les Moonves says that Dan Rather might not have stepped down if it wasn't for the Memogate scandal. Yeah, and I might be starting center for the Knicks if I wasn't 5'3". TrekUnited.com announced that three anonymous contributors have stepped forward with a $3 million pledge toward the campaign to un-cancel Star Trek: Enterprise. All that's mentioned of the deep-pocketed saviors is that they're "investors in the commercial space flight industry." This beefs up the less-than-otherworldly total of around $69,000 raised by all other contributers. Could the "Save Enterprise money be better used? Read this week's Static from the Geek In Chief. 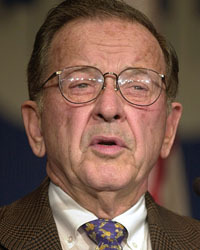 Cable TV shouldn't be exempt from FCC decency guidelines, Ted Stevens, a Republican Senator from Alaska, says. He wants to propose legislation to that effect. Maybe that's how people in Alaska like it, buddy, but we dig our filth down here- and we're quite willing to pay for it, thank you very much. Besides, I don't think Senators from outside the contiguous 48 states are actually allowed to propose legislation... are they? ABC's NYPD Blue went out on top. The long-running ABC drama's last episode easily won its time period... TNT has announced they've ordered a slew of new dramas, including a "limited series" based on the Steven King anthology Nightmares and Dreamscapes... Former "Friends" star David Schwimmer will direct Fox's workplace comedy pilot New Car Smell. Brooke Shields is slated to star. A day late, but never a dollar short, here's Joe Video's latest 99 word 24 recap... which we, coincidentally, call 24 in 99. Jack tortures Paul Raines, who reveals his connection to Marwan. Tony interrogates Dina, who reveals her connection to Marwan. Basically, everyone realizes that Marwan is in charge of the entire terrorist plan. Curtis escapes captivity, then meets up with Jack to pursue Marwan. CTU and Heller brief the president (STILL ON THE PLANE!) about the situation. More valuable plot time is wasted on Driscoll's SchizoDaughter, who finally offs herself at the end (thank god). Marwan is discovered, Jack pursues him, he is on the loose. Curtis gains control of the override, and Edgar saves the world from meltdown. Yey! Poll Results: Who should host next year's Oscars? There's something about Hurley, And this may be the Lost episode where we finally learn something about him- he has a heavy presence this week (ha, ha, 'cause, you know, he's fat). On Jack & Bobby, we have a serious Doogie Howser Alert as Neil Patrick Harris guest stars (hopefully it's a calmer turn than his Harold & Kumar cameo. And if aging, cellulite-thighed model/hosts are your bag, Tyra Banks hosts a new cycle of America's Next Top Model. Which show was Lorne Michaels not involved with? Answer: A). Lorne had nothing to do with SCTV. 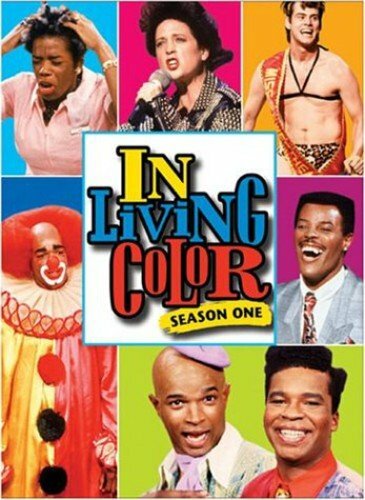 Who was never a cast member of In Living Color? Answer: A) Dwayne Wayans, who is deceased, never was a cast member of ILC. As of this writing, the ambitious folks at TrekUnited have raised $ 3,069,035.00 to save Star Trek Enterprise. But if you take away the donations of three wealthy benefactors, the tote board would read under $70k. Hardly enough to finance another season of the show. While rabid, diehard fans, a Star Trek trademark, try desperately to save the series, it seems many other, less vocal Trekkers feel that Enterprise was never the franchise's strongest effort, and maybe it's time to let it go. Split a cool million between all American Idol contestants to get them to disappear immediately, eliminating the need for airing the twice-weekly train wreck. What show should be cancelled instead of Enterprise? Vote in our Idiot Box poll now- in the right hand column!